How to write content that sells. Marketing for independent hotels is a bit different than marketing for one of the huge multinational hotel chains. The large hotel conglomerates can afford to enact lavish campaigns that blast their marketing message through print, television, radio, and internet outlets. As an independent hotel owner, you operate on a more modest scale. You still need to reach a large pool of prospective guests, you just need to accomplish it at a price you can afford. That’s what makes content marketing such a great fit for independent hotels – it requires an investment of time rather than of money. Try using these 10 Killer Content Marketing Tips for Independent Hotels – you’ll soon discover just how easy and affordable content marketing can be! The key to content marketing is offering information that is specifically tailored to your readers’ interests. Are you marketing to family travelers seeking out kid-friendly options or appealing to busy travelers looking for a hassle-free stay? Once you identify your target audience it is much easier to create content that will appeal to their tastes. Content marketing can help you achieve several goals at once, but you should have a key purpose in mind. Whether you are looking to build your hotel’s brand, raise customer engagement, or increase your booking rates, approaching content creation with a clear goal in mind will help you produce more effective results. Since the majority of travelers access the internet with a tablet or smartphone, it is essential that your hotel content marketing strategies are optimized for mobile. Test to see how your content, especially the videos, looks on a variety of devices before publishing to ensure a smooth user experience. Your socially-inclined guests are already documenting and sharing the unique experience your hotel has to offer. Feature these pictures and videos on your Instagram page, Pinterest boards, and YouTube channel to create effective, affordable travelogue adventures that viewers can’t wait to join. You already have a full time job managing your hotel – instead of trying to remember what to post and when, set up a content creation calendar. Include a topic for each of your posts and blogs so you can jump right into writing each day. 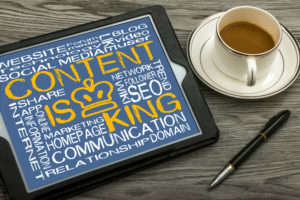 Visual content is one of the most effective content marketing strategies for hotels because it allows you to immerse visitors in the unique style and feel of your establishment. Create video tours of your hotel so guests can see everything you have to offer, with a focus on your hotel’s unique. Once you create interesting content, make the most of it by repurposing it in a variety of formats. Quotes and stats from that riveting blog you wrote make great Tweets; short blurbs with associated pictures work as Facebook posts; and so on. This repurposing helps you to create coordinated hotel content campaigns that pack a powerful marketing punch. A monthly email newsletter is a great way to keep in touch with your past guests while encouraging them to make a repeat visit. Be sure to segment your subscriber lists so each receives content particularly suited to their activities, and include special time-dependent deals for the best response. Content marketing generates a lot of data that can give you valuable insights into your visitors. You can see what strategies held their interest, which inspired them to click through, and which sent them looking elsewhere. Leverage this data to refine your marketing strategies for maximum effectiveness. If managing your hotel leaves you with no time to create content, turn to Travel Tech Strategies can provide you with content creation services to power your hotel marketing campaigns. We offer a full suite of support services for your hotel interactive marketing strategies including responsive hotel web design, mobile apps, and interactive marketing strategies, along with travel big data to refine your efforts. Contact Travel Tech Strategies today at 954-779-2801 for more content marketing tips for your independent hotel along with expert marketing support services to extend your marketing reach!